Our llama treks vary from full day (picnic) hikes to two day hiking trips or longer. We have trips for the experienced hiker as well as for the entire family. We can tailor a trip to suit your needs and ability. San Juan Mountains Llama Treks provides hearty meals, snacks and beverages, as well as all your camping gear for your back country adventure. You’ll be surprised at what a comfortable camp you will have when you hike with us. Besides tents, sleeping mattress and bags, there are roll-up tables and stools for the dining area and paraflies to keep the rain off. Forget the freeze-dried normal backpacker’s meal. Our llamas carry coolers for ice water, fresh fruits and vegetables, meats and frozen desserts! Please let us know well in advance about any dietary restrictions you may have such as vegetarian status, and we will do our best to accomodate you. 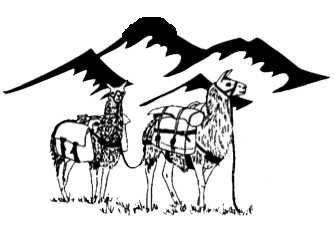 Drop Camp (the llamas pack you into a base camp and return to pick you up at a time you designate)……..$50.00 per llama (minimum of 2 llamas required per trip) and $150 per llama wrangler per day. Enquire for more specific details. Group discounts, discounts for children, and drop camps are available. Please call for current rates as prices are subject to change without notice. 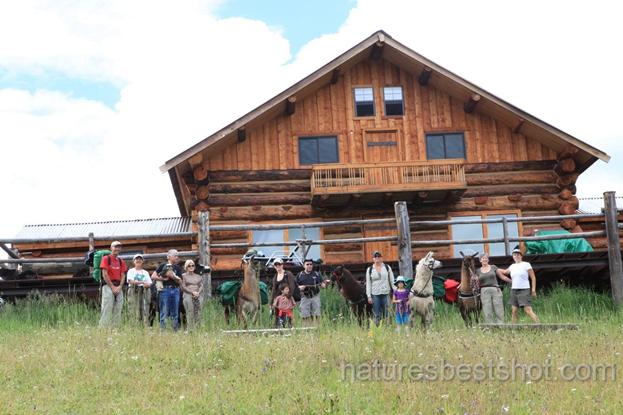 San Juan Mountains Llama Treks can plan an overnight hike for as few as four people or up to a group of eight. Eight persons with two guides keep the group small enough so that everyone can enjoy the wilderness and the solitude of the backcountry experience. It usually allows each hiker to lead a llama for the duration of the trip. The overnight hikes are rated as leisurely, moderate, or adventurous. On leisurely treks, the elevation gain is gradual and the campsite for the night is reached after covering approximately 2.5 miles. On moderate treks, expect approximately 1,000 feet elevation gain and 3-6 miles to the campsite. Adventurous treks are geared toward more than one or two nights on the trail. All treks take in the picturesque beauty of the mountains, with numerous wildflowers in mid-summer and the occasional sighting of deer, elk, turkey and other wildlife. Gift Certificates are available---Give a unique gift to that special someone, a deserving employee or an important client! Contact us for more information. This year, San Juan Mountains Llama Treks is offering a two-night, three-day trek to the High Camp Hut in the backcountry of the San Juans near Telluride, Colorado. This cabin is only accessible by hiking. Day 1: We will trek across from Lizardhead Wilderness area near the base of Sheep Mountain to a fully furnished (with comforts of home) log cabin, situated in a high alpine meadow. Day hikes can be arranged from our base camp at the cabin. The cabin is complete with wood burning hot tub, sauna, and pit toilet. Day 2: Full or ½ day hikes in the surrounding area. Day 3: Hike back to your vehicle. Trek includes all meals, plus sleeping bags. Subject to cabin availability; call for pricing. A minimum of 4 guests is required to make this trip a go! We would like to offer a list of items you will need for your hiking trek. Each item should be considered for it's usefulness, durability, and most importantly, weight. You need only to bring the basics as all of the "extras" are provided by San Juan Mountains Llama Treks. We ask that you pack all clothing and other articles not needed during the hike in a nylon stuff sack or any other lightweight, compressible bag to be loaded on the llamas. Please weigh your gear before leaving home and respect our 12 lbs per person weight limit (excluding any items you will be wearing or carrying during the hike). It is a good idea to have a day pack for easy accessibility of items such as your raingear, camera, or extra shirt. We recommend using a layered approach when choosing clothing for your trek. You will need one basic outfit to which you can add items of clothing to provide warmth and dryness. An extra set of clothing should be included in case the first becomes wet. Hikers who prefer to wear shorts will need only one pair of long pants to wear at night or after a rain. Personal pack. In a small ziplock bag put: ID, health insurance card, credit card or small amount of money, important phone numbers. Please do not bring a wallet, address book, jewelry or unnecessary cosmetics. Optional items: small camera and film, insect repellant, prescription medications, sunscreen, lip balm.